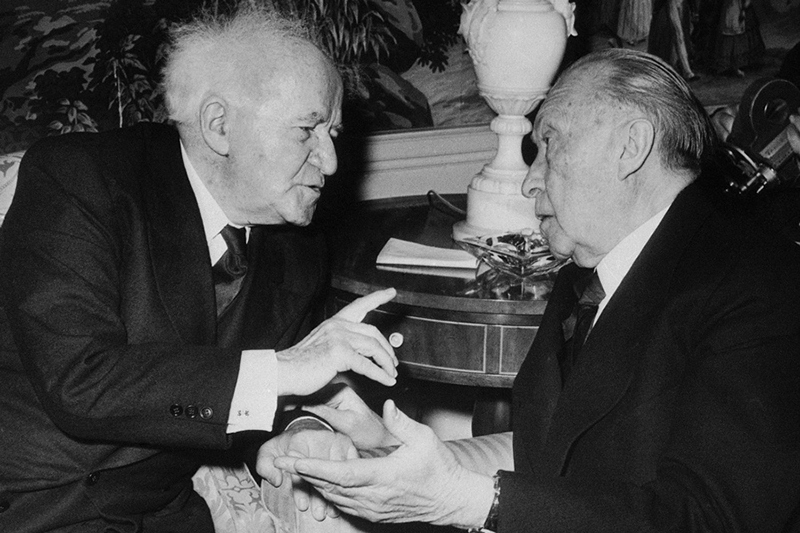 In the wake of the Holocaust, Konrad Adenauer and David Ben-Gurion forged an unlikely partnership. 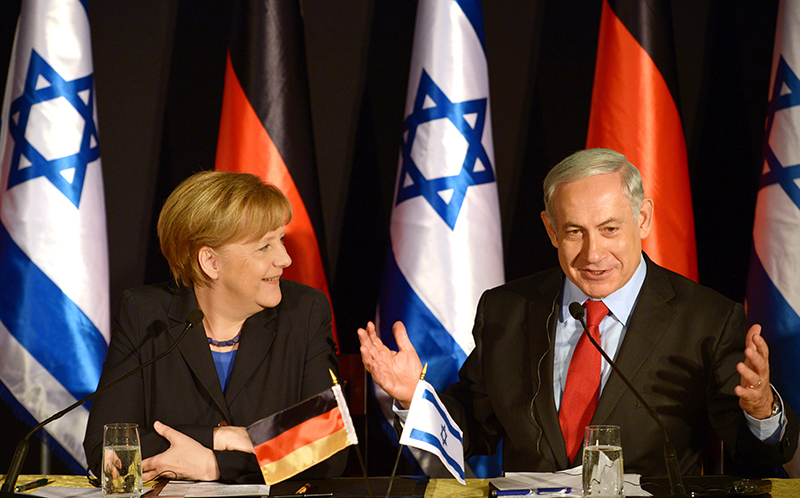 More than 60 years later, Germany continues to be one of Israel’s staunchest defenders and most dependable allies. But can the relationship withstand the rising tide of anti-Israel sentiment in Europe and the fading memories of a new generation? Last year, Daniel Barenboim’s West-Eastern Divan orchestra, made up of Israeli and Arab youths, ran into a logistical problem. The famed Israeli conductor had arranged for a group of Israeli and Palestinian musicians to play a concert in Qatar. The issue: Qatari customs wouldn’t accept Israeli passports, and not all the participants had access to the extra travel documents that most Israelis resort to in such situations. But Barenboim knew where to turn for help. The group traveled to Qatar on high-level German passports arranged on short notice by the German Foreign Office. The “of course” may ring oddly to American Jews—or others—who don’t think of Germany as Israel’s go-to pal in times of need. It’s more common to think of Germany still in the emotional tones of the post-Holocaust generation—a visceral reluctance to attend Wagner operas or to buy a Mercedes or a Volkswagen; a concern about the persistence of anti-Semitism; a sharp eye out for anything that smacks of denial or defensiveness. And those emotions run far deeper in Israel, home to the world’s largest number of Holocaust survivors. History hangs as a heavy cloud over any relations between Israel and the nation bound up most tragically in its rebirth. But today’s Germany is one of the best friends Israel has. Not many know that Germany is Israel’s largest trading partner in Europe (and its third-largest overall, after the United States and China); in 2013 Israel imported $4.6 billion in German goods ranging from chemicals to optical measuring instruments. That relationship extends to scientific exchange; security and counterterrorism cooperation; and weaponry. 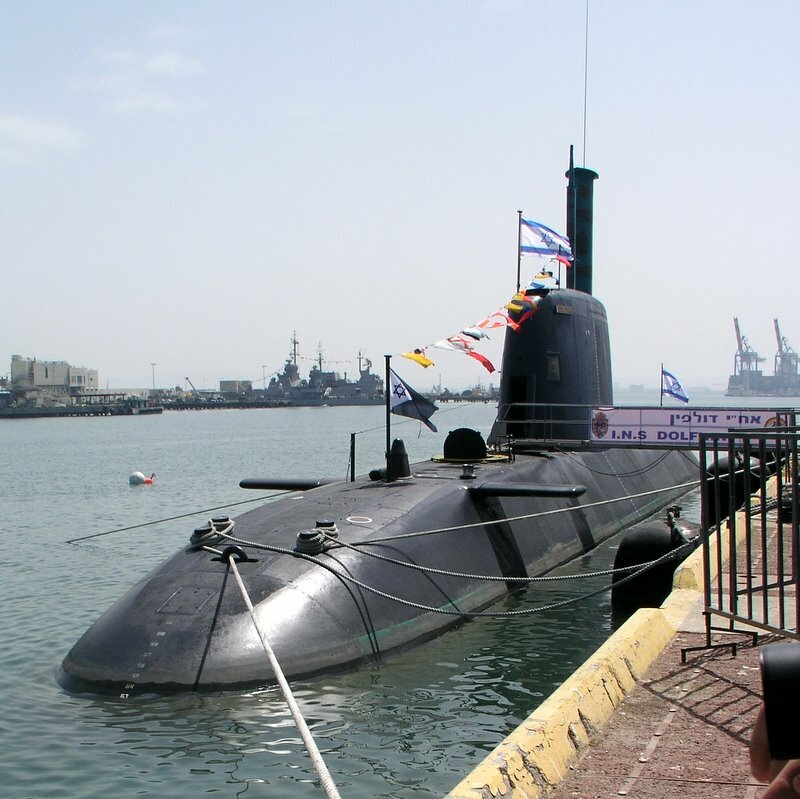 Germany is a major supplier and funder of Israeli arms, notably the Dolphin-class submarines that can be outfitted to carry nuclear missiles, considered the linchpin of Israel’s “second-strike” strategy in case of an attack by Iran. Since 1991, Germany has built and delivered five Dolphins worth $2.65 billion to Israel, subsidizing up to 50 percent of the costs. A sixth is on order, with Germany covering a third of the price tag. Prime Minister David Ben-Gurion with German Chancellor Konrad Adenauer in New York in 1960. Konrad Adenauer believed that reaching out to Israel was his nation’s only pathway to legitimacy and acceptance by the West. For his part, David Ben-Gurion understood that German investment could help his cash-strapped, fledgling state. Ita cold March afternoon in Berlin, a city so bustling with construction and reconstruction projects that crossing the street can be a challenge. Amid the hubbub, in a gleaming white stone building decorated with flags, is the Heinrich Böll Foundation, affiliated with Germany’s Green Party. The offices of a left-leaning European think tank seem like the last place you’d come for a testament to German support of Israel. But, says Bastian Hermisson, “German politicians of almost every party put the most emphasis on good European-Israeli relations.” Hermisson runs the Böll Foundation’s office in Brussels, home of many European Union (EU) institutions, and is well-placed to observe as German parliamentarians advocate for Israel and against boycotts and hostile language. “Overall the German parliamentarians are the strongest voice against boycott sentiment,” he says. “In the parliament, they’re outnumbered—they’re only 97 out of 751.” He adds that they can accomplish more in smaller councils and behind closed doors. Germany consistently lobbies on behalf of enhanced trade status for Israel. It pushes for Israel’s inclusion in EU programs: One is Horizon 2020, which will give Israel $417 million for scientific research over seven years. Advocates for Israel were disappointed last year when the European Court of Justice ruled on a long-running dispute, saying that products from the West Bank were not eligible for Israel’s favored tax treatment because they are produced outside its “core lands.” Though seen as a minor change well short of an actual sanction, the ruling has created an opening for pro-boycott forces: It gives member states the opportunity to label products by geographic origin, which may make it easier to boycott Israeli ones. German support for Israel isn’t confined to Europe. Germany was one of only 14 countries to vote in the United Nations against Palestinians’ bid for membership in the United Nations Educational, Scientific and Cultural Organization (UNESCO) in 2011. In 2012, advising the government of Tunisia on its new constitution, Germans applied pressure to remove a sentence defining Zionism as racism; the final text appeared without it. And German intelligence-sharing was a key factor, observers say, in bringing home hostage Gilad Shalit. German Chancellor Angela Merkel with Israeli Prime Minister Benjamin Netanyahu in Jerusalem this year. Angela Merkel, who grew up in East Germany, has expressed existential support for Israel in dramatic terms. But she is reported to be impatient with Benjamin Netanyahu’s government’s intransigence on the settlement issue. Konrad Adenauer, the first postwar chancellor and an inspirational, pro-Western figure, believed that reaching out to Israel was his nation’s only pathway to legitimacy and acceptance by the West. For his part, David Ben-Gurion, Israel’s first prime minister, understood that German investment could help his cash-strapped, fledgling state, which was struggling to absorb hundreds of thousands of refugees. During the 1950s, their vision of cooperation came true: Reparation funds from the Federal Republic of Germany laid the groundwork for Israel’s infrastructure—including roads, railways and shipping—while simultaneously rebuilding West German industry. In 1952, the two states signed the Luxembourg Reparations Agreement, in which West Germany agreed to pay three billion Deutschmarks (DM)­ to Israel directly—a hefty proportion in the form of German goods—and an additional 4.5 million DM to Jewish organizations on behalf of individual survivors worldwide. Eventually, the total reparations paid to Israel would reach between $25 and $30 billion, according to various estimates, including post-unification reparations given on behalf of East Germany. The amount paid out through various programs to all survivors worldwide is vastly higher, with some estimates as high as $100 billion. At first, the Israeli public fiercely resisted accepting German money. Crowds rioted outside the Knesset and broke its windows as Israeli lawmakers debated whether to approve the 1952 treaty; Menachem Begin, a leader of the protests, argued that taking German “blood money” would imply forgiving Nazi crimes. Eventually, the bill passed 60 to 51. In addition to money, Israel also needed weapons. As early as 1954, German reparation funds were secretly being used to buy patrol boats, tanks and arms. Germany itself supplied Israel with weapons through a variety of back channels. Many details remain untold, but a 2006 U.S. Congressional Research Service report concluded that German-supplied arms “played a considerable role” in building up Israeli military might in the wars of 1967, 1973 and 1982. The report also noted that the relationship went both ways: During the Cold War, weapons captured by Israel in the Middle East gave West Germans invaluable information about Soviet and East Bloc arms technology. The biggest question mark in German arms sales to Israel involves “Operation Samson,” the top-secret Israeli program to develop—it’s widely believed—an atomic bomb in the 1960s with assistance from France. During that time Israel also applied for a reconstruction loan of 630 million DM for a nuclear-powered civilian desalinization plant in the Negev, which was never built. Israeli nuclear historian Avner Cohen of the Monterey Institute in California, cited in Der Spiegel, says the evidence is pretty clear that German reconstruction funds were actually used for work on Israeli nuclear weapons. Israel, itself now an arms exporter, still turns to Germany—as well as the United States—as its defense needs evolve. In addition to the Dolphins, Israel recently contracted with Germany to pay $1.4 billion each for two guided-missile destroyers to protect its new offshore gas facilities. Israel has purchased five German-made Dolphin submarines and has a sixth on order. Even today, Germany supplies Israel with weapons, notably the Dolphin-class submarines that can be outfitted to carry nuclear missiles.The Dolphins are considered the linchpin of Israel’s “second-strike” strategy in case of an attack by Iran. While Adenauer and his ministers were busy supplying the new Jewish state with weapons, most West Germans were light-years from even beginning to grapple with the Holocaust. In 1945 the Council of Evangelical Churches made what is generally seen as the first attempt at self-examination, issuing the “Stuttgart Declaration of Guilt.” It said in part that “by us infinite wrong was brought over many peoples and countries” and expressed remorse for “not standing to our beliefs more courageously.” But the declaration made no specific reference to Jews or Israel. The screening in 1979 of the American fictional miniseries Holocaust was another landmark in West German consciousness, creating an outpouring of interest in topics previously treated in the abstract. Eventually, Holocaust education was expanded and became a model, ultimately reaching the current required standard of 20 hours’ instruction in high school, supplemented by visits to concentration camps. Young West Germans gradually became interested in Israel, finding less hostility from young Israelis than they expected in personal encounters such as sports activities and cultural exchanges. Many participated in volunteer service in Israel as a substitute for mandatory military service, working on a kibbutz or in an Israeli nursing home. A host of programs sprang up linking German youths with needy Jews abroad or placing them in educational internships at concentration camp memorials or Yad Vashem, Israel’s national Holocaust museum in Jerusalem. A group called Action Reconciliation Service for Peace, launched in 1958, places German youths in Europe, Israel and the United States to work with Holocaust survivors, refugees and the needy. A government-funded entity, ConAct, affiliated with the ministry for youth and families, coordinates the web of German-Israeli youth exchanges and arranges for semesters abroad and for Hebrew-language training. The Israeli Embassy in Berlin estimates that 6,000 German and Israeli youths participated in these programs in 2013. While West Germans were being taught to “work through” their feelings about guilt, responsibility and the Holocaust, East Germans studied a different, less troubling World War II. In 1989, when the Wall came down and Germans rejoiced, Israeli leaders initially viewed the reunification of East and West Germany with more trepidation than enthusiasm. Would a united Germany embrace and inherit West Germany’s sense of obligation, or be less chastened by its past? Yitzhak Shamir, then Israel’s prime minister, was so alarmed at the prospect of unification that he sent then-chancellor Helmut Kohl, who was popular in Israel, a letter asking for reassurances. The concern was not unique to Israel; several European leaders also expressed qualms. Unification has, if anything, turned out to be the opposite of what Israel feared. A more powerful and influential Germany has had more, not fewer, opportunities to be Israel’s friend. (Traces of East Germany’s anti-Israel stance remain in the Left Party, headed by former party chief Gregor Gysi—who is Jewish by birth.) But when Merkel became chancellor in 2005, Israel had a friend with the same conviction as Adenauer. Merkel instituted the practice of taking her entire cabinet to intergovernmental meetings in Jerusalem—meetings where her ministers, like kids on a field trip, could mix with their Israeli counterparts. This February’s meeting came at a time of political tension over the peace process but nontheless bore diplomatic fruit: a package of trade and cultural measures intended to mark the 50th anniversary of the official establishment of diplomatic relations between West Germany and Israel in 1965. It includes new scholarship and work-study exchange programs for Israeli and German youths; a long-negotiated $1 billion in additional compensation covering medical care for aging Holocaust survivors; and trilateral agreements for development work in places such as Burkina Faso and Ghana. Strikingly symbolic on a historical level, the governments agreed to make German consular services available to Israeli travelers in some 30 countries with which Israel has no diplomatic relations. A full-scale year-long commemoration of the anniversary is planned: There will be scientific and cultural exchanges, local and sister city events, exhibition soccer matches and a new Hebrew-German translation prize. The Germans will contribute $5.5 million and Israel, $278,000. The German government’s substantial investment in the anniversary commemoration inadvertently reveals concerns that the “special relationship” between Germany and Israel needs shoring up. From the postwar era on, there has been a dissonance between the pro-Israel consensus pursued by Germany’s political elite and the opinions of the general public. “There’s the official line and there are the opinion polls,” says Michael Brenner, director of the Center for Israel Studies at American University. Though polls show young Germans aren’t more hostile to Israel than other Europeans, the gap between their opinions and the opinions of the political class is wider. A poll taken in 2012 for Stern magazine found 60 percent of respondents considered Israel an “aggressive” nation and about the same proportion thought Germany had no “special obligation” toward Israel. One reason for this is clear: Most Germans are uncomfortable with the Israeli government’s position on Jewish settlements on the West Bank. Recently, frustration at what is considered to be Israel’s intransigence on the settlement issue is said to have reached even Merkel’s own Christian Democratic coalition. Personal friction between Merkel and Israeli Prime Minister Benjamin Netanyahu is widely assumed. “Merkel, whose commitment to Israel and Jews is gut-deep, simply no longer believes a word Netanyahu says,” complained Haaretz during the intergovernmental meetings. Merkel’s own allies have tacitly fed this narrative; there have been persistent leaked descriptions of phone conversations between Merkel and Netanyahu that deteriorated into yelling. Israel’s position on the settlements has exacerbated a generational problem particular to Germany: the fading of the sense of any “special relationship” among the third generation. Though intensively educated in school about their historical responsibility toward Israel and Jews, this generation shows signs of an increasing desire to be “normal” and to judge Israel on the basis of its political actions as with any other country. There’s also the part of the German population whose families emigrated from Turkey or the Middle East, who played no role in the Holocaust and feel no connection to the historical narrative they learn in school. Popular political sentiment suffers from another factor unique to Germany: the ongoing internal ambivalence toward arming Israel at all. This is a subject that touches on the two conflicting moral lessons postwar Germans have internalized through ceaseless repetition: Germany has a moral responsibility to protect Israel; Germany has an obligation to be hyper-conscientious regarding the use of force. Michael Wolffsohn, a retired professor at the Federal War College in Munich who is known as a conservative maverick voice on German-Jewish affairs, thinks the intense focus on Holocaust education is itself driving an emotional wedge into discussions of Israel. “Germans and Jews have learned totally contradictory lessons from history, and they’re both right,” he says. “Germans, from their history, have learned that the use of force is immoral and illegitimate. Jews have learned from the very same history that the use of force is sometimes necessary to survive.” It’s natural, then, that they can’t have a rational conversation about Israeli self-defense and the idea of being “forced to use force.” “Israelis might discuss the amount [of force], but Germans wouldn’t accept the proposition,” says Wolffsohn. German politicians have tiptoed around public disapproval. Hans-Dietrich Genscher, foreign minister from 1982 to 1992, defended submarine sales by offering the principle that “anything that floats is okay”—sea-borne armaments, in other words, can be assumed to be intended for self-defense, not aggression. After the war, a small number of Jews remained in Germany—most lived in West Berlin, having trickled back from displaced persons’ camps or fled Communist crackdowns in Eastern Europe. When the Wall came down, Jews from the former Soviet Union poured into the newly unified city. Today more than half of Berlin’s Jews are Russian-born and Russian-speaking. (Their priorities and interests are different, which has led to spats over governance and money.) In total, Germany has 115,000 officially registered Jews, and as many as 100,000 unofficial ones, including a growing number of young Israelis residing in Berlin. In Germany, Jews—like members of other religious communities—register with the government and pay a tax, which is then used to compensate clergy and subsidize buildings and other community expenses. These funds sustain a Jewish presence throughout the country, with numerous revived synagogues, several day schools, three Chabad centers in Berlin alone and a rabbinical seminary in Potsdam. Jewish culture is also popular with non-Jews, with cultural events such as the Jewish Film Festival drawing large audiences. The German Jewish community has not traditionally lobbied the government on behalf of Israel. There is no “German Israel Public Affairs Committee,” in part because the German government’s relations with Israel are not directly linked to domestic politics. The community, however, does speak up loudly on issues that impact Jewish life, such as the hot debate in 2013 over an attempt to ban circumcision. And it is keenly attuned to anti-Semitism, which is widely seen to be on the rise. A 2013 European Union report found that anti-Semitic attitudes (such as “Jews are to blame for everything”) could be found throughout the population, not just among right-wingers. A Bundestag report issued in 2011 found 20 percent “latent” anti-Semitism among Germans and quoted members of several Jewish communities, including Berlin’s, saying there were “no-go areas” for Jews and that they would not appear in public wearing a kippah. German Jews are accustomed to sharp criticism of Israel, but some anti-Israel sentiment is widely interpreted as a socially acceptable way to express anti-Semitism. “Grandpa’s anti-Semitism is dead; if you were an anti-Semite today, you’d dress up as an anti-Israeli,” says Micha Brumlik, a professor of education who recently retired from Goethe University of Frankfurt and is affiliated with the Green Party. Brumlik understands, however, a dimension of the psychological dilemma that Germans face: The more they are taught that they have a special moral obligation to protect and defend Israel, the freer they feel to criticize its policies on moral grounds. On the other hand, he adds, most Germans who criticize Israel on settlements also tell pollsters that they support Israel’s right to defend itself against Iran. This suggests, he says, that they are not hostile to Israel’s existence. Brumlik, like many of his compatriots, views the settlement issue as the main impetus for the increase in anti-Israel feelings among Germans, but other Jews blame it on anti-Semitic media coverage. Sacha Stawski—a Frankfurt-based Jewish businessman who runs a network of German-Israeli business councils and has an MBA from the University of Chicago—helped found a media watchdog group, Honestly Concerned, in 2002. “We felt then that anti-Semitism and anti-Zionism were coming out of the closet,” he says. “Unfortunately now it’s much worse.” His group helped pressure the Bundestag to issue the 2011 anti-Semitism report and to focus national attention on some regional pro-boycott groups that were using swastikas (officially banned in Germany) on their flyers. What’s ahead for the third generation—the ones whose grandparents, not parents, were perpetrators and victims? What will sustain Germany’s commitment to Israel in a future without reparations—or survivors? Deidre Berger, head of the American Jewish Committee’s office in Berlin, has spent time pondering this question in the AJC offices on the elegant, rejuvenated Leipziger Platz near the Brandenburg Gate. “In a time of political uproar and shifting alliances in the Middle East, we need to speak more openly about what carries the relationship now,” she says. “Shared intelligence, shared values, systems alignment—these should be the focus, not settlements.” Berger is engaged in a project dubbed “50/50”—trying to envision the special relationship’s next half-century. 1/Remember : Berlin was and remains Deutschlands Haupstadt…Why SHOULD Jerusalem become Arabic Jordan or whatever…? Jerusalem is Judean-Jewish for a bit more long times than Berlin has been created! (Only 12th Century Christ Era in Prussia even not yet Germany..;versus jerusalem 1000+ Before Christ Era. 3/ Remember: so far Germany was since 45 and now protected by Western Allies with absolute certainty and never attacked since and doesn’t have much risks for the large future..
” It gives member states the opportunity to label products by geographic origin, which may make it easier to boycott Israeli ones” puts it backwards. Israeli goods are already labeled as such. Distinguishing between goods produced in Israel proper and those outside the Green Line makes it possible to boycott the latter without boycotting the former. Without the separate labeling anyone wanting to boycott the occupation would have to boycott Israel altogether–so in fact this works against the BDS boycott of Israel & doesn’t promote it. Well written article. There should be no problem boycotting Israeli products originating in conquered territories. Boycotting Arab and Iranian goods and services for threatening annihilation,perpetrating suicide attacks, eliminating Israel from all maps in Muslim countries’ schools, murdering Jewish people in many other countries as Muslim anger/revenge acts of barbaric proportion in retribution and justification to Israeli “aggression” . This even-handed approach will never happen. Petroleum and natural gas is more important in this conflict.